The Caribbean boasts some of the loveliest islands in the world. In this list of the best Caribbean islands, we detail some breathtaking Caribbean islands that are truly special. Whether you are looking for relaxation or adventure, there is sure to be an island on this list that meets your criteria. For even more travel help, check out our list of the best travel accessories and best travel sites. This list will help you get where you want to go and make sure that you have everything that you need to have a great trip! Comprised of 60 islands, cays, and islets, the British Virgin Island’s biggest island is Tortola. Word class beaches of every shape and size are to be found here, as well as abundant shopping and dining. With 32 islands making up St. Vincent and the Grenadines there is always something new and fun to do. Turquoise waters, coral reefs, and remote, secluded areas are a big draw for nature lovers looking to get away from it all. The biggest and most populated island in the Cayman Islands, Grand Cayman provides a host of activities and amenities. Spa services, the famed Seven Mile beach, and Stingray City are just some of Grand Cayman’s draw. Nicknamed the nature island, Dominica is not to be confused with the larger island of the Dominican Republic. Perfect for hiking and diving, Dominica is an excellent choice for those looking to avoid hoards of people. The island of Providenciales is the most populated of the Turks and Caicos Islands and is consistently rated one of the best islands by visitors. Stunning beaches, upscale resorts, and excellent snorkeling and diving make Providenciales well-deserving of its rating. Home to the singer Rhianna, the lush West Indian island of Barbados offers something for everyone. Both calm and surf ready water are available, and delicious local food offerings round out the island’s appeal. Boasting the quintessential sand, sun, and water of the Caribbean, but with a Dutch flair, Aruba is a definite must-see. The island’s Eagle Beach has received high acclaim, and a host of available activities make the island fun for the whole family. With an array of historic sites, shopping, and white sand beaches, Puerto Rico makes for a great Caribbean island getaway. U.S. citizens can also visit Puerto Rico without a passport, making it ideal for a last minute getaway. Whether you are looking for romance, adventure, or relaxation the Lesser Antilles island of Saint Lucia has it all. Lush and unspoiled, Saint Lucia is an excellent option for tough to please vacationers. Part of the Leeward Islands, the northern half of Saint Martin is the French side, while the southern half is the Dutch side. Both sides, however, feature stunning beaches and great shopping. And, if you are a foodie, Saint Martin has excellent fusion cuisine. Long and slender, Eleuthera has the best of two worlds: a calm, tranquil Caribbean shoreline and a surfer’s haven on the Atlantic shoreline. Pink sand beaches and cliff vistas round out the island’s appeal, and the variety of water sports available on the island make it a perfect getaway for both families and singles alike. Located in the middle of the leeward islands, Antigua and its smaller sister island of Barbuda are a prime Caribbean destination. Antigua offers 365 public beaches, as well as great sailing and dining, allowing visitors plenty of things to do. With miles and miles of powdery white beaches, you will be able to find your little slice of paradise. Away from the beach, you will be able to round out your trip with unique tours of the island, fine dining, and a happening nightlife. Keeping in stride with the rest of the islands on this list, Nevis and St. Kitts are going to offer up amazing beaches and crystal clear water. Along with the beaches though, they also have some interesting historical sites and landmarks that are worth checking out as well. With all the activities, amenities, exploring and fine dining it is easy to see why Nevis and St. Kitts made our list of the best Caribbean Islands. At its largest point, the island of Klein Curaçao is 180 square miles, making it the largest island of the Dutch Caribbean islands. Whether you are looking to spend time at the pristine beaches, exploring the “Hato Caves,” or experiencing the culture and fine dining, there is going to be something for everyone on the island of Klein Curaçao. 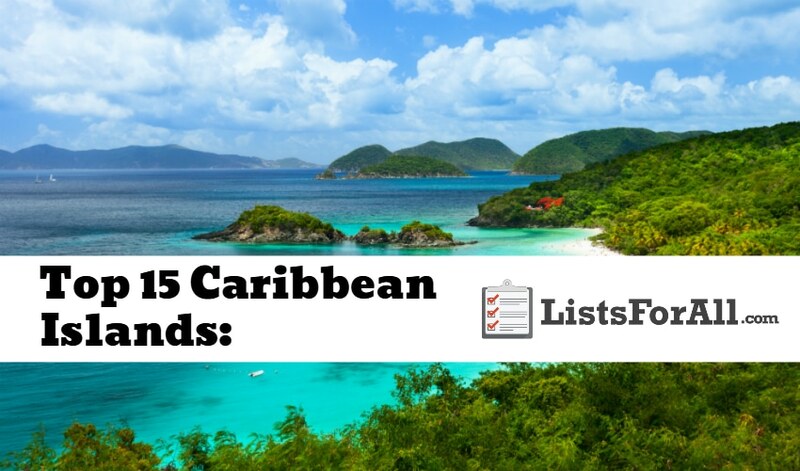 It is hard to picture having a bad time on any of these great Caribbean Islands, but if you are only able to visit one of a few of them, you want to be able to determine which ones are going to be the best fit for you. Each of these islands in our list of the best Caribbean Islands is going to have a slightly different vibe and feel to it. So hopefully we have provided you with a great starting point for planning your next vacation to one of several of these fantastic islands! Have you visited one of these islands? Let us know your thoughts in the comments below.